When I was pregnant with Ebby Lee (over six years ago) the trend for baby nurseries seemed to be bold colors. I chose pink, green, black, and white and we were all about some bold patterns and color in that room. I could only find mid-finished pictures. But this was one side of her room. This was the other side. You can't see the pink rug or much of the zebra print chair. I absolutely loved her nursery, but if I was making a little girl's nursery now I'd choose something VERY different. 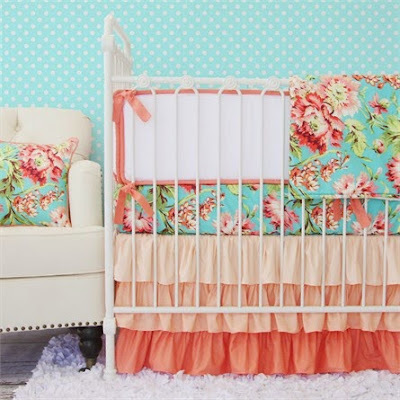 I perused Pinterest for some baby girl nursery inspiration-2015 style. This nursery looks so elegant. I'm not sure how practical the white chair is, but it is absolutely stunning in this room. 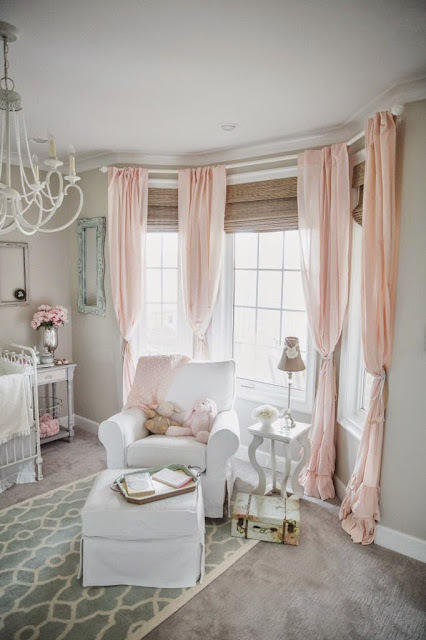 Love the chandelier and the soft pink curtains. Super cute! I think this is my VERY favorite one. I love the shiny gold with the coral and the gold polka dot wall is to die for. Love love love this room! If you're a fan of color (which clearly I am), this might be the one for you. 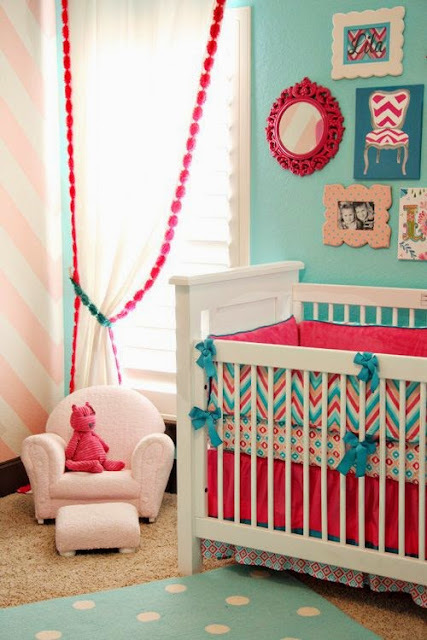 The turquoise and pink with those darling curtains is adorable! I love love love this coral and turquoise floral bedding. Apparently I'm a big fan of a floral with pinks and turquoise. 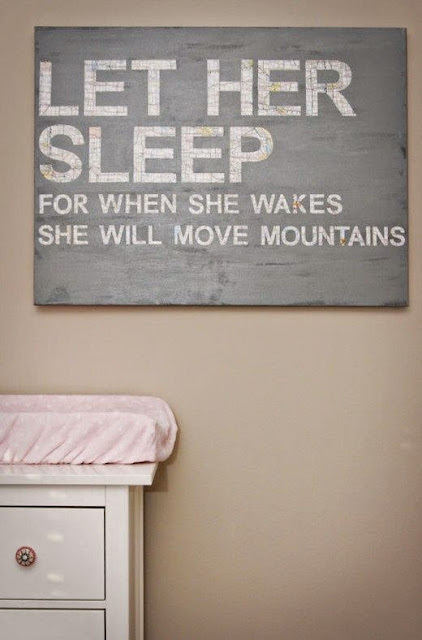 I've seen this sign before, but how cute in that pink and grey nursery? Love the table, the mirror, AND the striped wall! 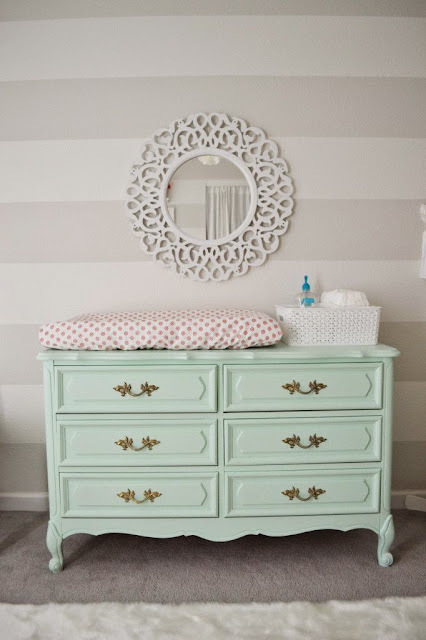 Okay, so if you had a baby girl, please share with us what her nursery looked like! If you haven't decorated a girl nursery, then please share with us what look you'd go for. What is your favorite? Excited to read about your favorites. We shared Baby Girl names HERE. We shared Baby Boy names HERE. Thank you for sharing!! 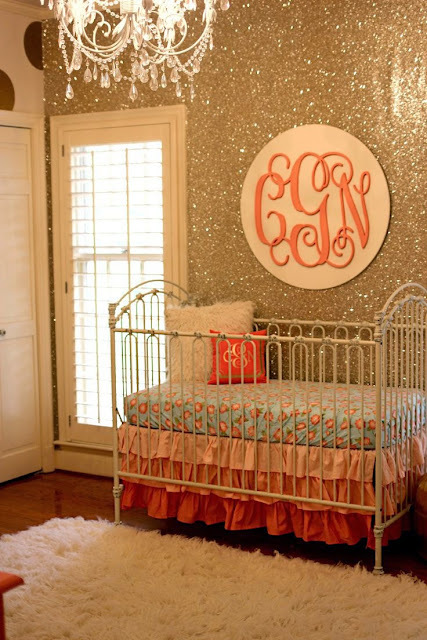 Love your pink, grey, and gold nursery! I loved Ebby Lee's nursery! I remember it so well! It's hard to believe she's going into first grade now...boohoo! They're getting so big! Aw, look at Ebby Lee's nursery!! So cute!! Presley's had bright colors as well. Love it! Gosh, this post really makes me want another baby!!!!!! Girl!! I almost referenced you in this post asking you if it made you want another baby!! Me too on the gold!! I remember the pink and brown combo! It was so cute! I'm having a baby girl at the beginning of September and her room will be decorated in coral, grey, aqua and possibly some gold as well. I can't wait to decorate! I love that sign! 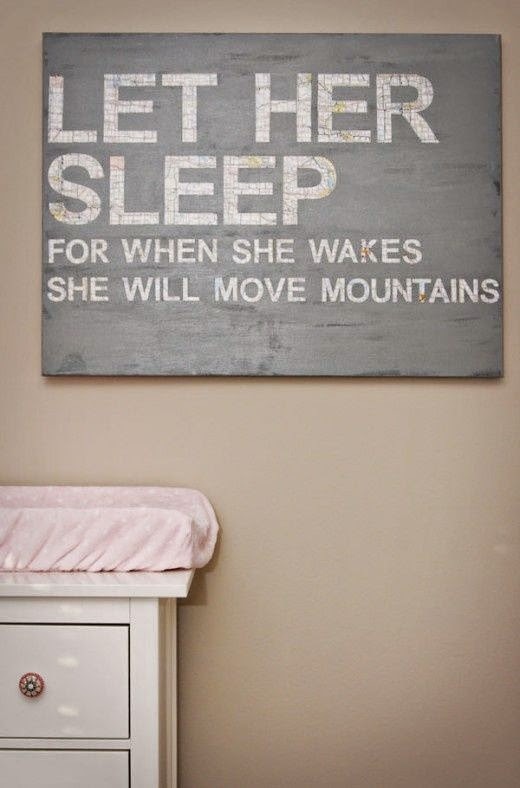 I think it would still be cute in my girls's room, even though they are older. I am due in October and we are not finding out the gender. I love all the ideas and would really love to see a post on gender neutral nurseries! So fun seeing everyone's different styles! I have two boys so I haven't been able to use any of the ideas I have for a girl nursery. However, rooms 2 and 3 are on my pinterest board. I love both those rooms! If I have a girl, one of those would be what I'd pick right now. But ask me in a few years and it will likely be something totally different! I'm due in November with my first. We are not sure of gender yet, but I do know that if it's a girl we want to do gray and a light pink or gray and a light purple. I'm loving all of these suggestions! How long were you and Tab married before you were pregnant with Ebby Lee? I would love to know your tips for newlyweds and your advice for what to do and how long to wait before having a baby.